Not to belabor the point, but last week’s trip really caused me to stop, reflect and refocus. I’ve been so caught up in a lot of emotional baggage, that I finally had to threaten to charge myself the extra $15 per checked bag to encourage myself to limit the baggage to one carry on. The goal would be to fly with only the clothes on my back, but I’m starting realistic. After all, I’ve never been one to hop on a plane, destination anywhere, and see what happens…this is why I love to watch the Amazing Race but never send in an audition tape. Part of this effort to find the right focus for my life is to really be mindful and grateful for the gifts I do have in my life. Peanut’s post-trip, terrible twos behavior makes this even more important. It’s so easy to get caught up in the tantrums, the whining, the minute-to-minute attitude changes that I might miss the giggles in between the growls. As a result, I’m challenging myself this November to write a short post every day about something I am grateful for. Feel free to join me, if you like. Or share what you’re grateful for in that day’s comments. I feel blessed that my child and the hubby provide me these moments every day and as much as I notice them, I want to really be mindful of them. Particularly as we enter this very busy holiday season. So join me on November first…I’d be ever so grateful! Last week’s trip was good for a variety of reasons. One of which was the mental breakdown I had Thursday. What did she say? Good because of a breakdown? Well, actually, yes. Living far away from our families has caused me a lot of guilt and self-flagellation in the two years since peanut was born. I want peanut to have close and loving relationships with all of his grandparents, aunts, uncles and cousins. As a result, I do my best to update our family blog, send out pictures often, send out the occasional video, mail cards decorated by peanut, encourage phone conversations with peanut when possible and, of course, we struggle with what’s the “right” amount of times to make the 360+ mile trip home for visits. When this trip presented itself because the hubby was going to be at a conference for a week, I saw it as a perfect opportunity to provide our family members one-on-one visit time with peanut. Usual visits cram as many large-scale family dinners or get togethers in as possible and I always feel that what gets lost in the festivities is any real chance for anyone to get to know our incredibly funny and engaging little guy. So I let everyone pick a day. I scheduled and planned and as a result, I ran myself ragged. By Thursday, I was so physically exhausted from the driving and the sheer weight of dealing with a toddler’s schedule in flux that I quite lost it. It wasn’t my proudest moment. When my mom came home from work, I was in tears. A bowl of chicken soup and quite a few hugs from both mom and dad later, I was good. More than good. I realized that the guilt was too much for me to handle. I had to let it go. I had to realize that I was doing everything in my power to create relationships for peanut and that I can physically only do so much. Most importantly, I had to realize that I can’t change it. I can’t change that we live far away. I can’t pretend that we don’t. I can’t pretend that it’s easy. Sometimes, I have to realize that I just can’t. This is something that my dear hubby has been telling me for a long time. This is something that I thought I had done. But once it’s truly gone, once you really, honestly let go? Wow. I physically feel lighter, freer. And with the holidays approaching, it couldn’t have happened at a better time. Who needs a side of guilt with their pumpkin pie when whipped cream is a much better complement? The strange thing is that most of my friends are also raising their children at some distance from their families. For some, it’s only one or two hours away, or one or two states. For others, it’s nearly a continent. We’re all raising great kids who know, love and respect their families. I know there are probably families who live only a short driving distance away from each other and don’t see each other often – I just assume physical proximity breeds close relationships. Not always the case, I’m sure. So I’ll continue to do what I can – peanut will continue to kiss his family night-night via pictures hanging in his room, he’ll continue to produce art work for refrigerators everywhere, he’ll keep “mashing” stickers on family birthday and holiday cards, we’ll keep telling him funny stories about his relatives, we’ll continue to involve him in the gift selection process for various occasions, and we’ll make the trip up for Christmas. And when it’s too much? When we have to make a tough decision? I’ll feel badly, but I won’t feel guilty. That’s a trip I refuse to take again. I’m back. Physically, anyway. Mentally, I’m still trying to get back on track. Wow. What a week. Remember how I said it was going to be a relaxing week? Well, I take that back. The trip was full of lots of activity that translated into lots (and lots and lots) of time in the car between where my folks live now and where everyone else lives in the Triangle (our total mileage for the week between the round trip from Atlanta to NC and all our driving in between was 1,098. I felt a little queasy when I added that all up.). Peanut did not take a lot of naps and was also up early each morning. We’re still trying to rectify the sleep deficit. Just when I think we’re doing better we have a tired-induced meltdown about which bib he’s going to wear during lunch. Fun, fun, fun! Indoor bounce houses. Giggles (and sore glutes) all around. Playing guitar with his Opa. Peanut totally losing it at lunch with Nana and Aunt M. Nothing like witnessing and dealing with your toddler’s worse meltdown in months. In front of your mother-in-law. In public. Peanut peppering his Nana with kisses (post-meltdown, post-grilled cheese ingestion). Flirting with all the ladies at Grandma’s office. Hand prints in clay with Gran Pam. Restaurant booth Olympics with Aunt J and his other Uncle J. Play dates with college gal pal’s little ones (really, could Izzie and Jonathan BE any cuter, ladies?! Carolina girls make adorable babies!). Seeing peanut’s eyes light up after a week away from the hubby. It was a long trip, in more ways than one. But for right now, we’re just glad to be home in our own beds, in our own routines, all three of us back together. Exactly where we should be. The peanut and I are road tripping it again. We’re heading up to NC for a relaxing, week-long visit with the family. Well, relaxing once I survive the six-hour drive with a toddler by my lonesome. If you know me, you know I’ve been obsessing about this for about a week. I’ve traveled alone with peanut before. There have been two airplane trips to NC solo. No big deal. Quick flight. Totally doable. There was the drive to the mountains for a long weekend with the sister. But that was only a four hour drive and he was in the habit of sleeping in the car then. I’ve got the portable DVD (thanks, Jess), snacks, books, a plan. We’ll totally be fine…right? Right? But once we get there, ahhhh! My parents will be armed with a bottle of wine with my name on it and they will be more than eager to take the little one off my hands. Every day of the next week has a visit with a family member or friend. The fall weather should be perfect for walks and exploring. Afternoons (provided peanut actually naps) on the deck with a book or a journal will be restorative for mommy. Evenings of just me and my folks. I’ll miss the hubby like crazy and I know peanut will, too. But the excitement of watching peanut interact with his family…well worth a potentially painful drive and stressful week of routine management. Most of the family hasn’t seen him since June. And my, my, he’s growing up so much. So it might be dark here at High Heels and High Chairs for a few days. But just think of all the fun stories I’ll have to share on the flip side? Tonight is the final event. The last time we’ll see them before the big decision. I’m so excited to see the posturing, the spinning, the arguing. There’s bound to be a few angry words and maybe a few moments of finding common ground. The families will be there to offer their support to those working so hard to fulfill their dreams. And the best part? The moderator. Oh, you thought I meant this? Nah, chances are they won’t say anything new. I’m hoping for some real drama on Bravo. Although if Bob Schieffer actually pushes the candidates to “make it work,” then it might get interesting. (Note: Don’t get me wrong, the presidential debates are an important part of our voting process. If you are still undecided, please tune in so you can make an informed choice in November. I’m High Heeled Mama, and I approved this message). Update: I caved and watched the debate. Project Runway’s on the DVR and will be watched momentarily. But debate drama? At least it was interesting this time around. The economy is in ruins. So I did what every red-blooded American with a kid and only one income does when times get tough. I went shopping. Shopping as a stay-at-home-mom has got to be one of my biggest challenges. I know I’m not alone. I’ve seen enough episodes of “What Not To Wear” to know I’m not the only one scouring for bargains, stocking up on capris/flip-flops/hoodies, and choosing comfort over style. I know I’m not the only one who finds it easier to justify a purchase for the peanut or for the home before I can justify buying a new pair of jeans at Old Navy. For me, though, the clothes still make the mom. I feel better in my nicer duds. I don’t have a style, per se, but in summer, you will often find me in a skirt and flats at the playground. Don’t get me wrong, for every day I’m in a skirt there is another day where I haven’t showered after a workout and you’ll find me five hours later at the playground in my workout clothes (although I do prefer the running skirt over shorts – hate the short-induced ride-up) or a day when I’m in a ratty tank top, shorts and flip flops. But the days I’m in the skirt and flats, I feel better about myself. So, I’ve been thinking about what I need to spruce up my jeans and long-sleeve T winter wardrobe. Black pants. I don’t know what happened, but all my old work wardrobe black pants just don’t work anymore. How could I not have a nice pair of black pants? They can go to Target or on a date night or to Alphabet Club. Two stores and 8 pairs of pants later, I have a beautifully versatile pair that were totally ON SALE! So I bought a second pair of trousers in a very versatile tan. Also ON SALE! Then we popped in the shoe store. I have in my mind’s eye the perfect pair of boots for my mommy wardrobe…unfortunately, the only ones I can find are $500. A bit out of my current price range. I struck out again today, but did find (ON SALE) a sassy pair of Joan & David brownish/bronzish patent peep-toe pumps that spoke to me. And do they ever make me feel like me in them. These are some rough times we’re in. But I don’t have to look it. At least not every day. Every day it’s the same old routine. We wake up, eat breakfast, run our errands, do our activities, eat lunch, nap (well, peanut does), play outside, eat dinner, bath and bed all at the same time each and every day. I know this routine provides comfort for peanut. Knowing, in general, what to expect throughout the day makes the day run smoothly for both of us. An established routine also means that I can abuse said routine when I need to for special activities and not pay the price with a complete meltdown…as long as we’re back on track within 24 hours, that is! I’m beginning to wonder, however, if all this routine is putting me in a bit of a rut. I’m planning a trip to see the family for a week and it’s starting to stress me out. Not because I’m nervous, although a six-hour solo drive with peanut is a bit of a nerve-wracking thought, but because it’s outside the normal day-to-day routine. And how will peanut, and I for that matter, react to establishing our routine in a different place with totally different time pressures? I know deep down we’ll be fine because we’ve done it before. But I am hoping that this little jaunt will help inspire a rejuvenated routine when we return. Certainly the routine will stay the same, the wake-up, the mealtimes, the nap times, the scheduled classes. But in those down times — the two hours of nap time, the after bed time evening time with the hubby — I think I need a change. Sure, checking my feed reader and monitoring my friends’ Facebook status while catching up on the DVR is fine for giving my brain a rest, but I think I need a little bit more. Things are good…but can’t they always be better? So, when I get back from my trip later this month, a few things are going to change around here. First of all, I’m busting out the paint cans. The kitchen and breakfast area need a serious face lift and have since the moment we moved in four years ago. I keep putting it off and putting it off, but I’m going for it. If I can cut off nearly six inches of hair, I can certainly paint a few rooms in a pleasing apple crisp orange and relaxing, soft sage (aptly named for this project “rejuvenate”). While I’m gone, I’m going to work up some ideas on shaking up my routine in the little ways that will give me a better glimpse of me in my mommy day. Maybe dedicated reading space and a new box of teas for nap time. Maybe putting the DVR in overdrive in the evening with a chosen night of TV catch-up time so that evenings can be better spent writing or watching movies with the hubby. I don’t know. We’ll have to see. The good thing about a rut is that the view is so much better when you climb up to the top. Here’s to a new perspective. During a phone conversation this weekend, High Heeled Mama’s sister taught peanut how to say “Happy birthday old man” in anticipation of our father’s birthday this week. The giggles that followed on both ends of the phone line after peanut repeated it accurately cemented this as a funny line in peanut’s mind. While chatting with my mom on the phone last night, peanut shared his new funny phrase with her. She, of course, thought it was hilarious. “Grandma like it!” Which then sent him into a giggle fit through the rest of lunch. Sorry, Dad. Looks like peanut will do anything for a laugh. On the bright side, at least he’s not calling you “Poopa” anymore! All those music classes are finally paying off! Peanut is currently obsessed with singing. He has always loved music – listening, dancing, trying to name the instruments we hear. Even in utero he would respond to the organ during Sunday Mass. Lately, however, he’s started to try to sing along with a few ditties. We noticed awhile ago that he would fill in the last few words of a phrase of “Twinkle, Twinkle Little Star” if we paused. Recently, we’ve added the Carolina alma mater to his fill in the blank repertoire. Why? Because we’re shameless, that’s why! In reality, I sang it to peanut during lullaby time after a recent big football win and since that moment, he’s started asking for “the Tar Heel song.” Today, he sang his ABCs! He needed a nudge at around H, but still managed to get through. At least he’s singing, right? Another benefit: the more he sings, the less I have to sing. And I think we can all agree (right, High Heeled Sis?) that that is a very good thing. Crazy Toddler Habits? Get in Line. Peanut is great at playing alone. 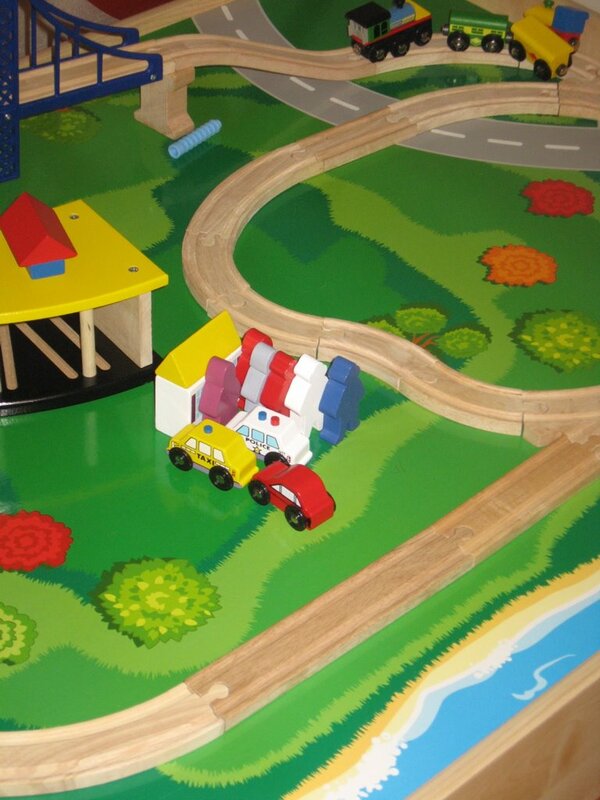 He’ll stand at his train table and run his trains, cars, boats along the tracks. He will sit and look at books for a half hour. He will bang out a tune on his xylophone. 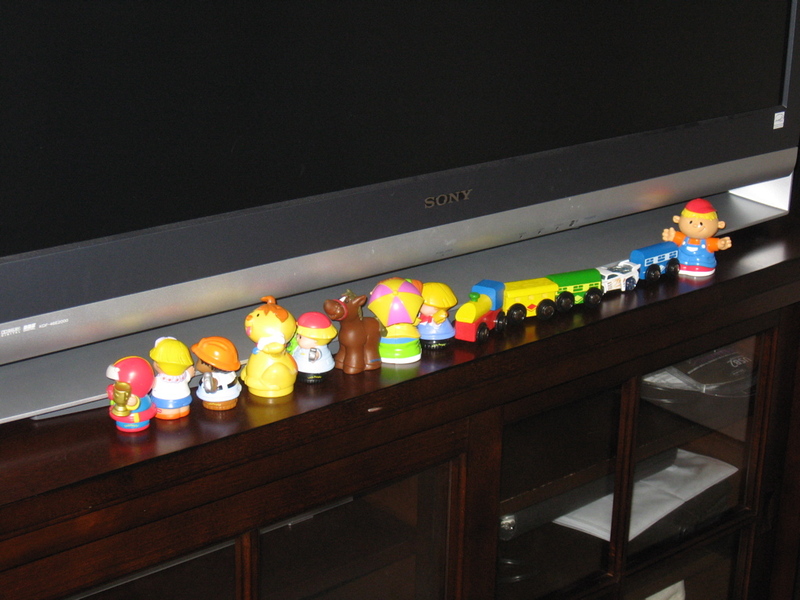 He lined up all his people on the entertainment center. Not sure what they were waiting for, but peanut insisted they stay there all day. He lined up all his animal toys on top of his cubby bench like he was Noah directing them two-by-two through the storm. What does all this lining up means. He’s orderly? He’s geometrically inclined? He’s obsessive-compulsive? He wants to work in the post office/DMV/grocery store/bouncer at a hot club? Not really sure, but it’s quite entertaining. Now, if only I could figure out how to parlay this new talent into a Halloween costume, I’d be set!